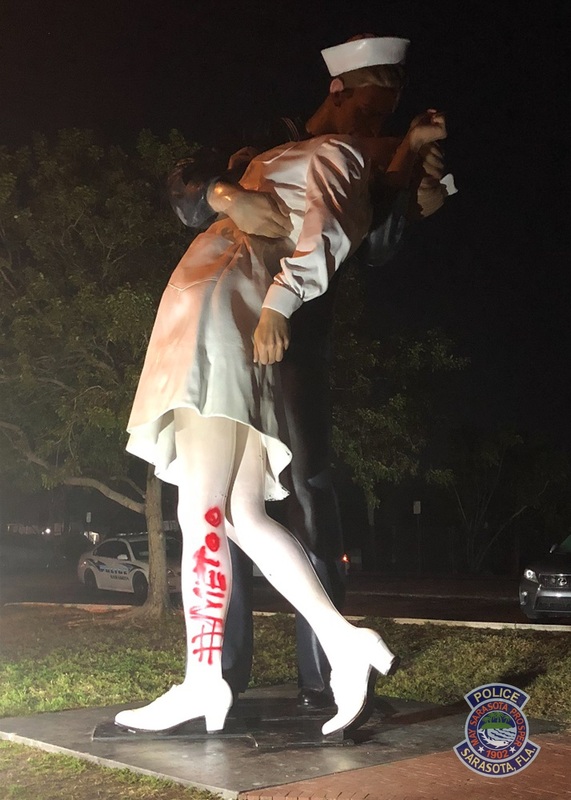 #MeToo Graffiti Scrubbed From Sarasota V-J Day Kissing Statue A towering statue depicting the famed embrace between a sailor and a woman in white, celebrating the end of World War II, has become an unwelcome symbol of assault to some. #MeToo graffiti was discovered scrawled onto the leg of the woman being kissed in Sarasota's "Unconditional Surrender" statue. Is it an innocent display of jubilation over a war's end or an unacceptable act of sexual aggression? The context of a kiss is clashing with an evolving emphasis on consent in the #MeToo era. On Tuesday, the city of Sarasota, Fla., announced it had removed red #MeToo graffiti scrawled on the leg of the woman in the "Unconditional Surrender" statue. The 26-feet tall structure looming over the city's bay front is based on the famed photograph of a sailor embracing a woman on V-J Day, when Japan announced its unconditional surrender, effectively ending World War II. The Sarasota Police Department said it discovered the vandalism early Tuesday. But, with no witnesses or surveillance footage, they are asking for the public's help identifying a suspect. It was Aug. 14, 1945, when New York City's Times Square erupted in a happy uproar and Life photographer Alfred Eisenstaedt was on a mission to capture "the storytelling moment." He saw a sailor reach for a woman in white, tilt her back and plant his mouth on hers. Eisenstaed got the shot creating a piece of Americana, currently being scrutinized under a new light. Navy photojournalist Victor Jorgensen also captured the kiss from a different angle, but his image was somewhat eclipsed by Eisenstaedt's. However, the Tampa Bay Times reports that the creator of the statue in Sarasota, Seward Johnson, was, in fact, inspired by Jorgensen's image. 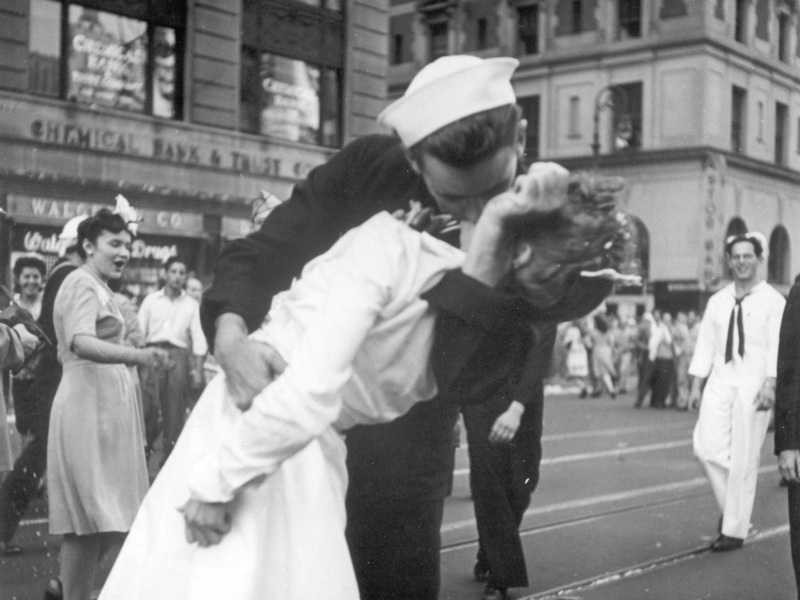 Navy Photojournalist Victor Jorgensen snapped this lesser known version of sailor embracing a woman in celebration of the end of World War II in New York City's Times Square in 1945. George Mendonsa, who died Sunday at the age of 95, had long said he was the man in the photo. In a 2005 interview, he told the Library of Congress's Veterans History Project that he had downed a few drinks and amid the "wild" scene on the streets took the unknown woman into his arms. Greta Zimmer Friedman said that woman was her, telling the Project in a separate interview she had stepped out of the office where she worked as a dental assistant when she felt herself being "grabbed suddenly." "It wasn't my choice to be kissed," she recalled. "(I)t wasn't a romantic event. It was just an event of thank God the war is over kind of thing." Friedman died in 2016, so she cannot say whether she would have identified with victims of sexual assault and harassment uniting today under the #MeToo hashtag in a worldwide movement. Others have also claimed they are the ones pictured, and with the faces obscured and no names being taken at the time, the issue of identity remains somewhat murky. But with Mendonsa and Friedman's stories being widely accepted, the vandalism is stirring up mixed reaction on social media, with some users applauding the #MeToo message and others standing up for the statue. "Stop glorifying the 'taking' of [women] against their will," said Facebook user identified as Bonnie Gustow. "I used to love this statue until I learned the history." Brenda Wren echoed the sentiment imploring officials to "Remove the statue." But others say the statue captures a moment in American history worthy of reverence. "Youngsters just don't understand the exuberance of the end of WW II," said Bernhardt Moore. "That may be the most celebrated kiss in history. Sorry that your lens is so distorted on this moment." John Cloud, who owns the Sarasota company Gorilla Kleen, said he was spurred to act after seeing news of the vandalism. "It's just sad to see anyone in this day and age choose to purposely do damage to something that brings great pride to the community," Cloud told Sarasota's ABC affiliate. He said his company removed the spray paint free of charge. Facebook user Tracy Topjun pointed out the inevitability of two different eras and perspectives colliding, posting, "I actually think this makes that statue more beautiful and far more powerful. In 2009, Jack Curran, a Navy veteran, bought the statue for $500,000 and donated it to Sarasota under the condition that it would remain on display for a decade, reports the Sarasota Herald Tribune. Jason Bartolone, a spokesman for Sarasota told NPR that the statue will remain where it stands until June, 2020, when the ownership will transfer to the city from a nonprofit group. He said it is unclear at this time what will happen to the statue next year. It's not the first time the statue has sustained damage. In 2012, it had to be disassembled and sent to New Jersey for repairs after being struck by a vehicle.